Are the often alarming claims about global warming based on science and justified by the facts? Is the human race really facing a major crisis due to emissions from fossil fuels? Would the proposed Climate Treaty solve a real environmental threat or would it create worldwide economic and social harm? S. Fred Singer is a distinguished astrophysicist who has taken a hard, scientific look at the evidence. In this new book, Dr. Singer explores the inaccuracies in historical climate data, the limitations of attempting to model climate on computers, solar variability and its impact on climate, the effects of clouds, ocean currents, and sea levels on global climate, and factors that could mitigate any human impacts on world climate.Singer’s masterful analysis decisively shows that the pessimistic, and often alarming, global warming scenarios depicted in the media have no scientific basis. In fact, he finds that many aspects of any global warming, such as a longer growing season for food and a reduced need to use fossil fuels for heating, would actually have a positive impact on the human race. Further, Singer notes how many proposed “solutions” to the global warming “crisis” (like “carbon” taxes) would have severe consequences for economically disadvantaged groups and nations.According to Arthur C. Clarke, author of 2001: A Space Odyssey, Hot Talk, Cold Science dares to point out that ‘the Emperor has no clothes.’ Is there evidence to suggest discernible human influence on global climate? Of great interest, this book demonstrates that, at best, the evidence is sketchy and incomplete. 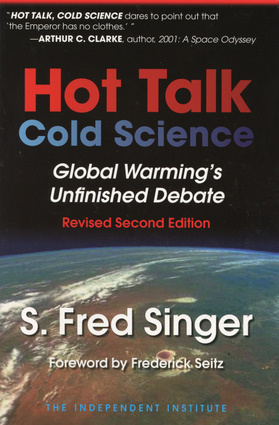 Hot Talk, Cold Science is essential reading for anyone who wants to be fully informed about the global warming debate. S. Fred Singer is research fellow at The Independent Institute, president of the Science and Environmental Policy Project, and a distinguished research fellow at the Institute for Space Science and Technology. He was the first director of the U.S. Weather Satellite Service. He is the former director of the Center for Atmospheric and Space Physics, and former chief scientist, U.S. Department of Transportation.